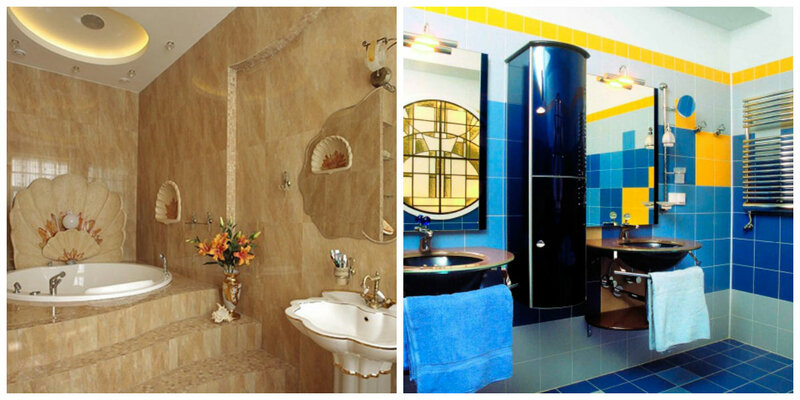 One of the most natural ways of decorating bathroom is beach style. 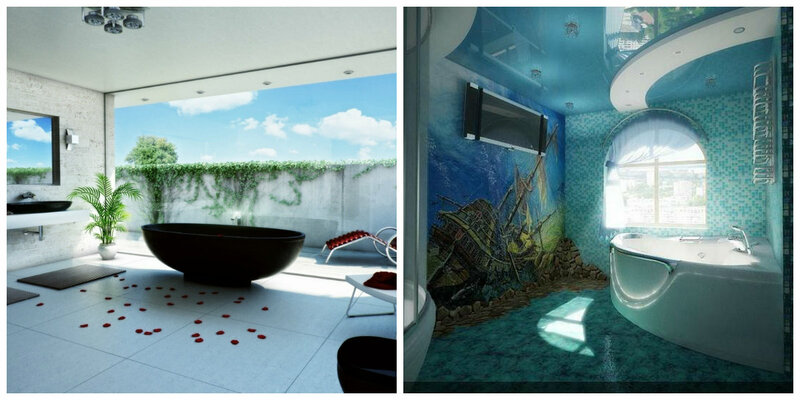 Marine design in bathroom is primarily displayed theme of sea in decoration. Let’s try to understand your preferences on specific examples so as not to be deceived as a result. Here are beach bathroom ideas. 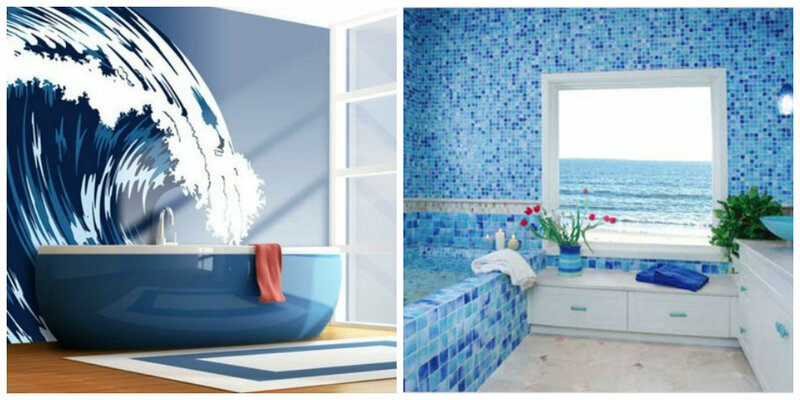 Blue is the most universal in beach bathroom ideas. It can be dense blue color, like water at bottom of ocean. 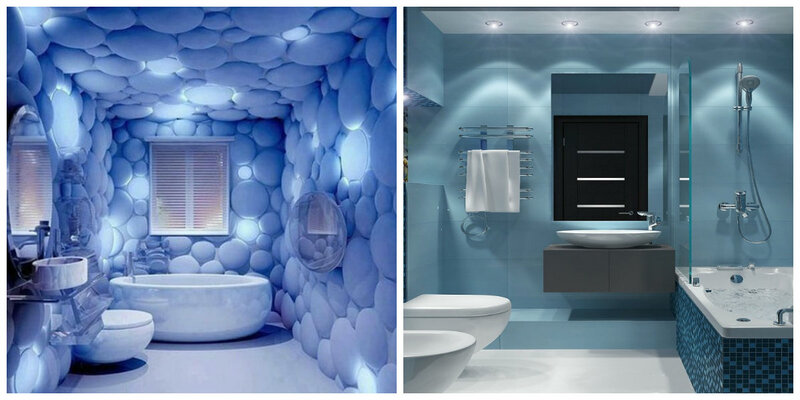 Pale blue bathroom will become wonderful place for rest. It will create feeling of coolness in summer heat. Turquoise will remind you of unforgettable summer vacation at sea. Monochrome turquoise color goes well with natural wood, stone, sand color. If you want to make in your bathroom mysterious tropical beach, then add green as 3d pictures on vinyl wallpaper, live plants, if space allows. But if your bathroom is too small, then artificial souvenir palms, vinyl stickers on walls, decorative liana around mirror will give little color variety. Bathroom decorated with blue and yellow tiles will look unique. Yellow in combination with blue will create sense of sea shore, and revive monotony of blue. Interesting solution will be choice of shades of sand color. In such bathroom, traditional blue and white may not be present at all, but it will unmistakably look like sea sandy beach or seabed. 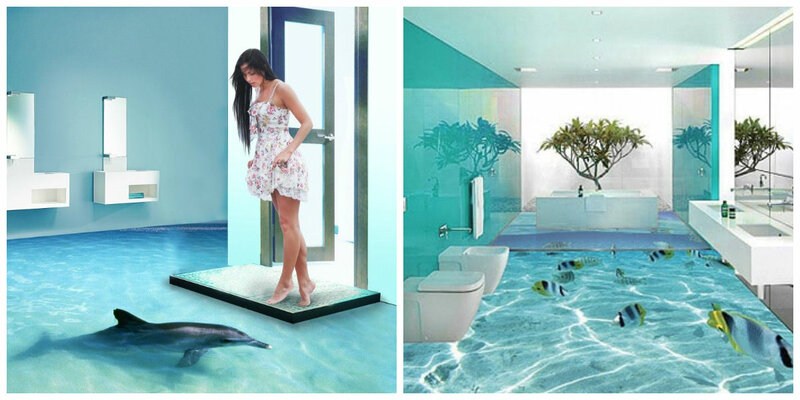 3d floors in bathroom can become the only, but decisive accent. You don’t need to decorate room with shells or photo-tiles. In addition to undoubted decorative advantages, self-leveling floors have number of other advantages in front of many variants of floors in bathroom: This is environmentally friendly floor; has high coefficient of moisture resistance; has good thermal conductivity; doesn’t conduct electricity; prevents reproduction of fungal microorganisms and mold; it can’t be damaged by acids, alkalis, and oils. Mixing techniques of finishing surfaces can give the most unexpected results. 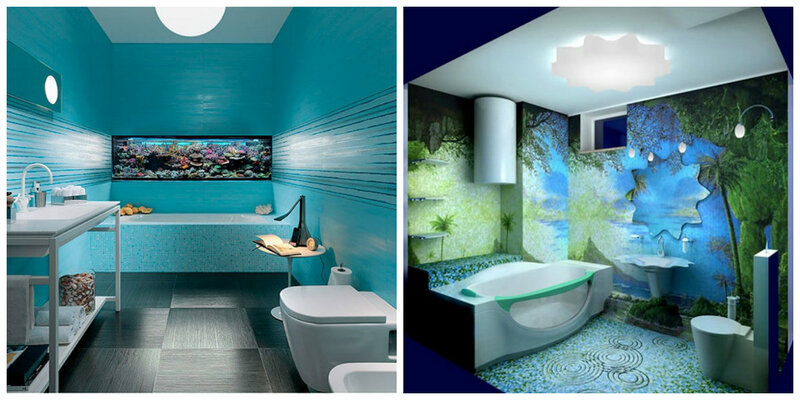 For example, one wall can be decorated with pattern on sea theme, floor can be laid out with 3d tiles, and soft turquoise mirror stretch ceiling will give your bathroom feeling of lightness and freshness and significantly expand space. 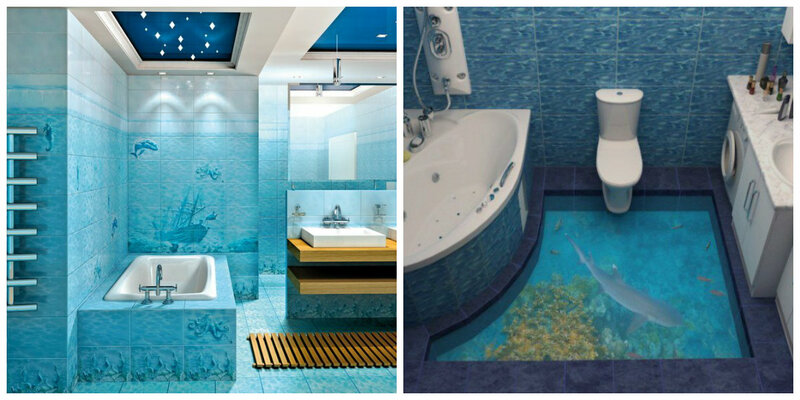 If you have large bathroom, marine theme will be emphasized by aquarium with real marine fishes. Thus it may be located anywhere, it all depends on your imagination. 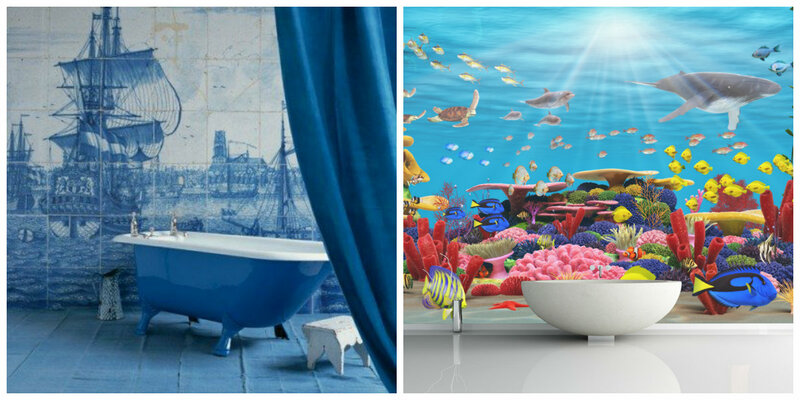 If you have combined bathroom, and toilet doesn’t fit into maritime decor, so we offer you such interesting version of aquarium on toilet. 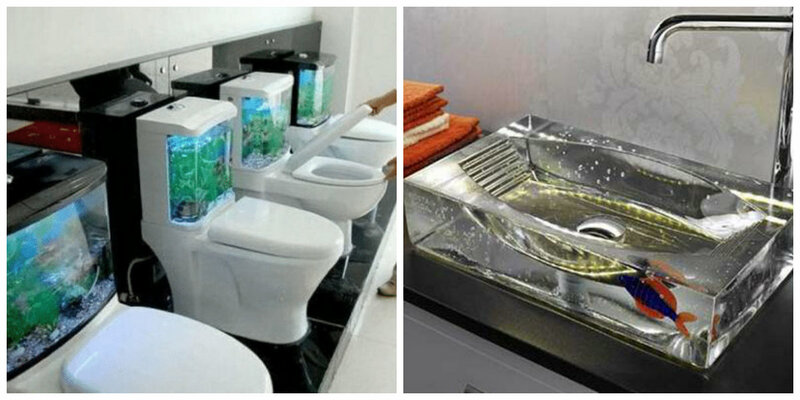 Aquarium can also make sink. Such washbasin perfectly fits into marine design. In bathroom you can create imitation window, through which you can easily enjoy sea view. The other feature is equipment of two-level lighting, which will bring magic into situation. It is also appropriate to look niche in wall, for example, decorated with seashells. The next solution is transparent shell filled with moving fish. Photo wallpapers, which depict seascape, will certainly be excellent addition, helping to relax. Thus, to give room marine look, don’t require excessive effort, you can personally accomplish task, harmoniously combining shades.